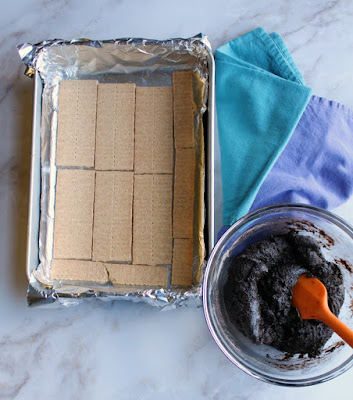 Super cute and really tasty s'mores bars can be yours in almost no time at all. They only require 5 ingredients and almost no effort! Take that iconic s'mores combination and make it into a fun bar. With a graham cracker base, deliciously gooey chocolate brownie-like layer and fun toasted marshmallow topper it is hard to go wrong! The best part is the recipe starts with a cake mix, so it whips up quick and easily. You can have it in the oven in a matter of minutes! When Peeps signed on as a sponsor of #springsweetsweek, I was so excited. Few things are as iconic at Easter time as those marshmallow chicks and bunnies. 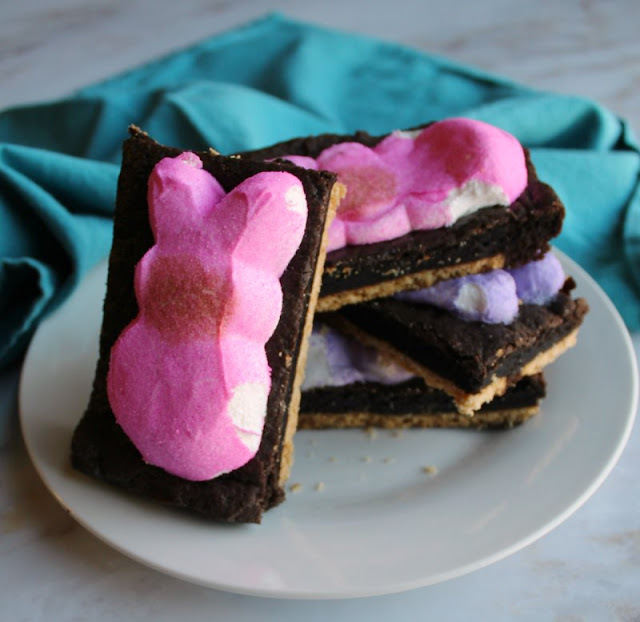 I already had a s'more dip recipe on the blog that utilizes Peeps, so I thought it would be fun to explore that theme a little further. Excuse the bad humor, I can't help myself sometimes! Back to the matter at hand, I was really happy with how these bars turned out. I had them in the oven less than 10 minutes after I decided to make them. With only a short 15 minute bake time, they are ready in a jif. I would let them cool a smidge before you cut them, but you can always put them in the fridge for a couple of minutes if you are in a hurry. The graham cracker base gives them some stability, so you can keep the chocolate layer on the gooey side if you'd like. Each bite has the perfect combination of textures and flavors. My boys were pretty excited when they saw them. It's hard not to get excited about something as fun and tasty as these though. I loved using the bunnies for this, they made cutting even pieces a breeze. I also made some simple sweet and salty nests for the chicks. I shared the recipe on instagram. When it comes to Peeps, are you team #PEEPSchick or #PEEPSbunny? I lined my pan with foil to make cutting the bars easier. You can just lift the whole batch out of the pan and cut them without cutting into the side of the pan. To easily line your pan, form the foil over the outside/bottom of the pan. Once it is shaped, place it inside the pan. I found using my fingers was the easiest way to spread the batter over the graham crackers. The bars cut more cleanly if they have a chance to cool and set up a bit before removed from the pan and cut. You can store these at room temperature for up to a week. Be sure to check out all of the fun spring sweet week recipes and enter to win the fun prizes from our sponsors. Find the prize info here and the disclaimers at the bottom of this post. Lay the graham crackers in the bottom of the pan, forming a single layer. In a mixing bowl, stir together cake mix, eggs and chocolate. Spread over the graham crackers. Bake for 10 minutes. Remove from oven and place Peeps over the chocolate layer. Return to oven for 5-6 minutes. Cool before removing from pan and cutting into bars. You don't have to line the pan with foil, it just makes removing the bars and cutting clean even slices easier. Another brilliant, cute and yummy creation. These are darling, easy and will make everyone smile! Happy Friday sweet friend! Hope the weekend is great! Such a cute idea for a treat! 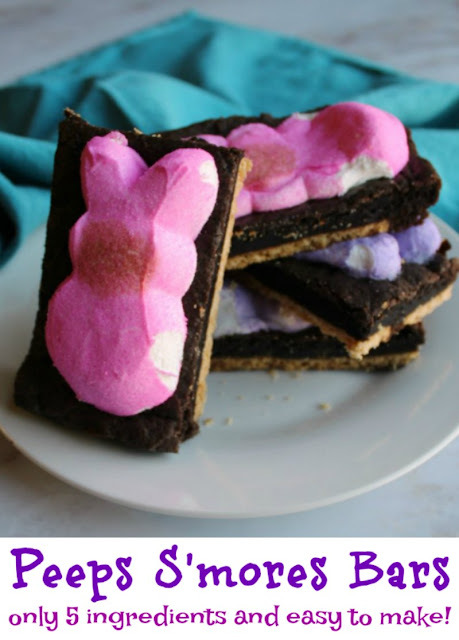 My family loves s'mores and this is such a festive (and easy) idea for Easter and spring. I've never done indoor smores. 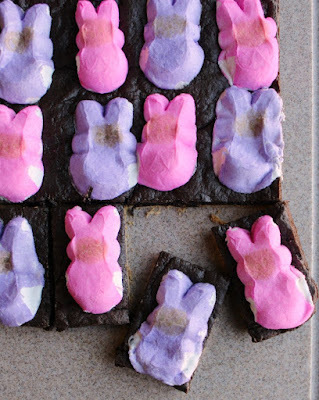 These are super cute with the peeps on top. What an easy fun treat! What a fun idea! And so easy to do, too. How darling are these!!! Such a cute Easter treat. 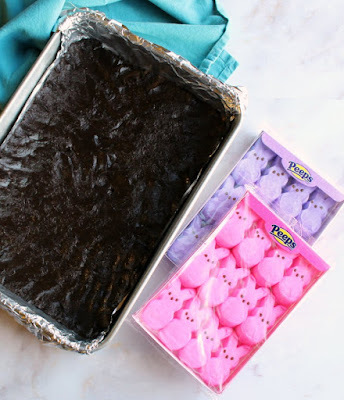 Who needs a campfire, when you can make PEEPS s'mores in the oven?! I love that you added a brownie cake layer. Yum! It makes it sooo easy and you don't have to worry about rain! These are such a great idea! You can't go wrong with an easy and fun dessert! I love s'mores, and I love the idea of making them in a batch for everyone to enjoy- yum! I'm in love. I love S'mores and I love Peeps. Come to momma! Ha! I'll have to make you a batch! I'm not typically a s'mores fan, but THESE - these I can get on board with. That chocolate cake/brownie layer - ohmygah! They really are delicious! And no worries about the chocolate bar not melting in the s'more! This is awesome Carlee. I may squirrel away a package of the bunnies to make this soon. Love how cute these are! 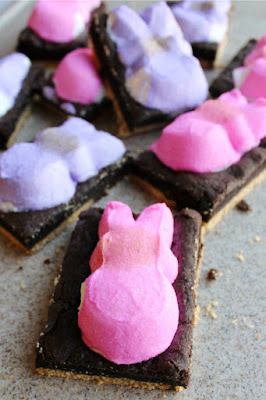 The perfect way to eat some peeps!